We congratulate Bill Bulawa, for 25 years of service as a Project Surveyor. When speaking with Bill about his 25 years, he says “Oh how technology has changed”! With the invention of the Robotic Total Station and GPS, today’s “survey crew” many times consists of only one person now. Bill first began his surveying career in 1982 with the U.S. Army 82nd Engineers. Bill went to Madison Area Technical College in 1989 and obtained his Associates Degree in Land Surveying. Then, Bill worked for the U.S. Army Corp of Engineers and then with Vierbicher 25 years ago. 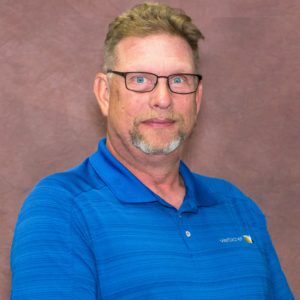 Bill is a Professional Land Surveyor, licensed in Iowa and Wisconsin. Bill worked and lived in the Reedsburg area when he first started with the company. He was a part of the Property Survey Division until 1999 when Vierbicher opened their Prairie du Chien office. Bill and his family relocated and still reside in the Prairie du Chien area. Moving to Prairie du Chien was like moving back home for them because they grew up near there. Bill has been married to his wife Julie for 28 years and they were blessed with 2 daughters. We would once again like to thank Bill for his 25 years of service with Viebicher.